East of the River Park Master Plan	The Minneapolis Park and Recreation Board is working with the community to develop a new plan for all Minneapolis neighborhood parks in the Northeast/Southeast service area, east of the Mississippi River. Weigh in on the latest iteration of park designs that will guide long-term development of all neighborhood park properties in Northeast/Southeast Minneapolis. Please consider attending a Community Advisory Committee (CAC) meeting. Meetings are open to the public. Call or send an e-mail to the project manager, Carrie Christensen, if you have initial ideas, want to discuss the project, or would like to request the project team come to your organization’s meeting. Check back here regularly to find out the latest on how to stay involved. The Youth Design Team (YDT) is a Minneapolis Park & Recreation Board pilot program for the East of The River Park Master Plan. It employs high school students to participate in the planning of neighborhood parks in NE and SE Minneapolis. 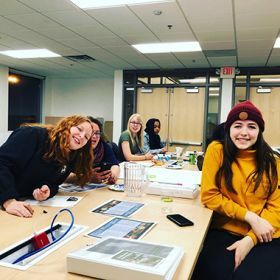 During the year-long process, these youth work with MPRB planning staff, design consultants, local artists, and community members to help bring important youth perspectives and creative ideas to the process and park plans. Youth Design Team participants went through a competitive application process, are 15-19 years old, live or attend school in Northeast or Southeast Minneapolis, and are interested in professional fields in art or landscape architecture, community-based research, environmental design and park planning. The YDT has worked on all stages of the plan including site inventory and analysis, community data collection, data analysis, and park planning and design. The YDT has had hands-on experience learning concepts, building skills, and gaining professional experience, all while helping to impact the future of parks in their communities. Follow the Youth Design Team on Instagram at East of the River Parks! 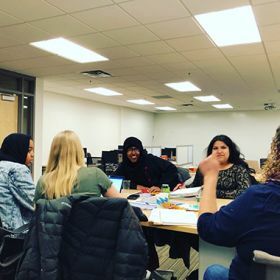 MPRB Planning staff, Siciid Ali, meets with the Youth Design Team and provides a community outreach activity training, to hear from residents and understand what park activities people would like to see in their neighborhood parks. Youth Design Team members at the Mississippi Watershed Management Organization learning about the value of our watersheds and the connection between responsible water management, stewardship and conservation. Youth Design Team members learn about and conduct walking audits of neighborhood parks. On these park assessments, they document important park features, maintenance and accessibility issues, and other considerations for park improvements. The YDT visits Silverwood and Audubon parks to see different art installations. They write their own poetry pieces and further discuss the role of public art in parks with local poet, Erin Sharkey. Youth explore natural and wild spaces at Deming Park with artist and park enthusiast, Ben Weaver. 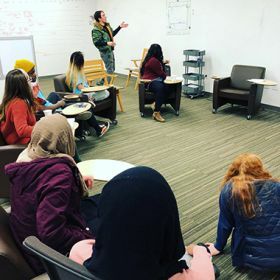 Patience Caso from Hennepin County’s Green Partners Environmental Education Program visits with the Youth Design Team to talk about waste sorting and reduction methods at parks. The Youth Design Team helps facilitate a Community Design Sessions with neighborhood groups across the service area. Youth Design Team members learn about the Urban Agriculture Activity Plan from park staff, Ellen Kennedy, and community food justice leader, Martin Brown. 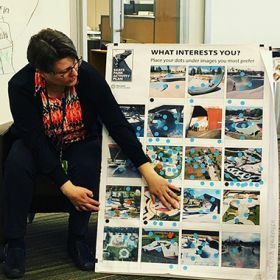 Colleen O’Dell of MPRB Planning talks about the community outreach, research and development of the Park Board Skate Park Plan with the youth design team. March 2018. 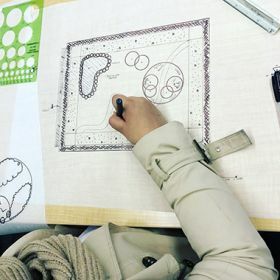 The Youth Design Team learns the basics of hand drawing plans in landscape architecture with Professor Brad Agee, and MPRB Project Manager of the East of the River Park Master Plan, Carrie Christensen at the U of M School of Design. 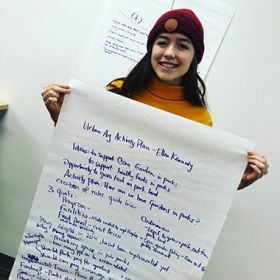 Drawing upon the data analysis and community voiced themes, Youth Design Team members work with design consultant, Mo Convery, of Perkins & Will, to develop park concept designs. The YDT developed park plans for 11 neighborhood parks. Youth meet with Perkins + Will design consultants and MPRB planners during Design Week to discuss park plan concepts for the East of the River Master Plan Open House.